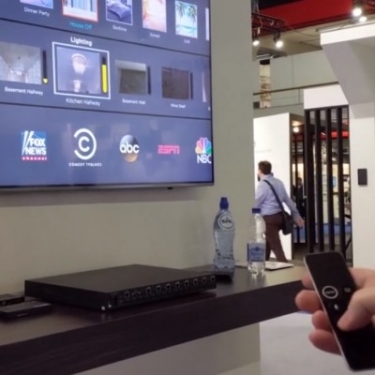 At ISE 2019, Savant demonstrated smart-home control via on-screen display (OSD) using Apple remote. 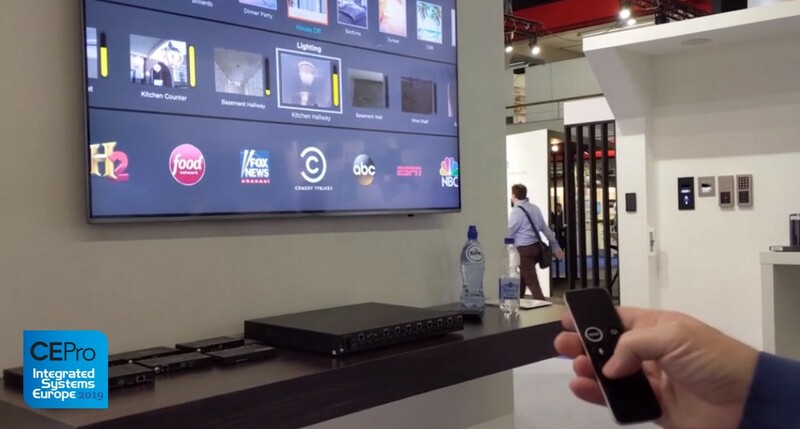 At ISE 2019, Savant demonstrated home-automation via on-screen display (OSD) using Apple TV and the companion remote ... an industry first. Correction: This particular demo does not illustrate Savant's forthcoming two-way IP control of Apple TV. That particular implementation has been demonstrated elsewhere (see it here). We apologize for the mischaracterization. But ... do enjoy this demo of Savant control via OSD through Apple TV. All you need to control a Savant home automation system on the big screen is an Apple TV box and an itty bitty companion remote. At ISE 2019, Savant demonstrated two-way integration between the two systems, showing how anything in the Savant smart-home ecosytem could be navigated and controlled through an on-screen display (OSD) via Apple. The Apple announcement of two-way integration last year was a very big deal. Control4, Crestron and Savant were reported as the the first three home-automation partners at the time. In addition to Savant, Crestron demonstrated its own Apple TV integration at ISE, but offered a different implementation. As far as we know, Savant is the first with an OSD implementation. As for Savant, the company introduced its dealers to the new Apple TV solution just a few weeks prior to ISE during the company's 2019 Integrator Summit. Several dealers told CE Pro they were wowed by the demo. ISE 2019 was the first time the rest of the world got to enjoy the spectacle. In the demo, Savant international sales director Trevor de Maat pulled up the Savant services on the TV using the Apple remote, and navigated through a three-level UI featuring home-automation scenes at the top, connected devices and rooms in the middle, and favorite channels along the bottom. The integration is rich. de Matt showed how the user could navigate to a set of lights in a particular room, and then use the touchpad on the Apple TV remote to dim or brighten the load ... just from the thumbnail view on the TV OSD. On the thumbnail image, you can see how the lights were responding ... in real time. Don't care to scroll around? Simply press and hold the microphone button on the remote and tell Siri what you want. OK, OK, I goofed on this one. My apologies. It was a great demo and first of its kind (that I know of) but this was NOT the two-way IP control demo. That has been shown elsewhere. We’ll have details of that one to come. Thanks for well-deserved spanking, but still a good Savant implementation. I agree with Carlton, unfortunately, Julie you are mixing apples and oranges here (pardon the pun). The video simply shows and AppleTV app controlling Savant. Interesting, but that is available to any Apple developer that chooses to write an app for the AppleTV. At CEDIA 2018 in San Diego I did see a demo at Savant’s booth that actually was two-way control o the AppleTV from Savant. Using the Savant remote the demo interacted with the native Apple TV and using the microphone built into the Savant Remote voice commands were routed to Apple Siri. That was very impressive and AFAIK, none of the other big-3 that had their logo flashed on the stage last June at Apple’s WWDC 2018 (Control4 or Crestron) have produced anything other than a vague press release. I just wish I had spent more time at the Savant demo seeing as it has become a “rare sighting” and no other details have been forthcoming. If Savant showed THIS capability at ISE, that would be newsworthy and much more interesting. From what I learned after the dealer presentation, the Apple TV has a Savant App running on it that allows this to work and control the Savant system. Using the Apple TV remote is an option but you can also control the Apple TV from any other Savant interface; remotes, apps, etc via IP control and Siri on the Savant remote. It’s pretty slick really. They even showed a dedicated mode, like guided access for iOS devices, that keeps the Apple TV running as a dedicated OSD for applications using video distribution. There’s more there that I’m forgetting but it was an impressive demo for sure. The details on what’s being shown in the video are lacking. Is this a Savant App running on the AppleTV that is controlling the Savant controller? If so, this isn’t IP control of an AppleTV by a Savant system (from the referenced prior announcement), this is the opposite: IP control of a Savant system from an AppleTV app/remote.